NAZ NOMAD AND THE NIGHTMARES-GIVE DADDY THE KNIFE CINDY. 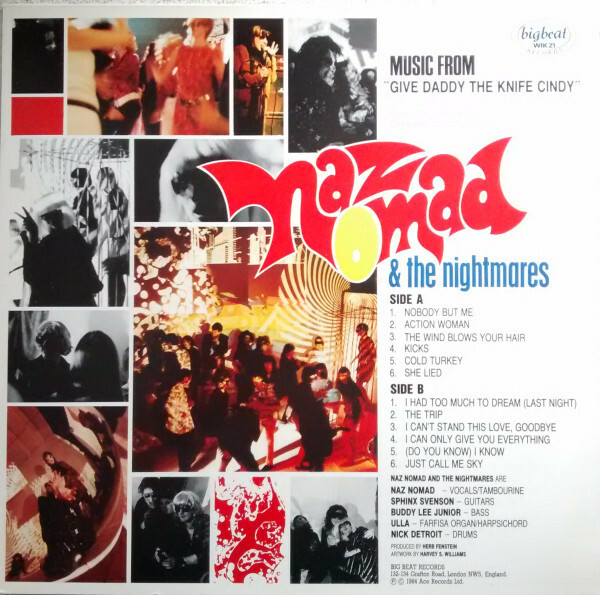 In 1984, London based Big Beat Records released Naz Nomad and The Nightmares’ album Give Daddy The Knife Cindy. At first glance, it looked like the reissue of a soundtrack to a low budget American horror film. Especially, when the album cover stated copyright 1967 American Screen Destiny Pictures. There was even a list of those who had ‘starred’ in Give Daddy The Knife Cindy. The album was beginning to look like the soundtrack to a long forgotten film. Or was it? Some weren’t so sure. They wanted to find out more about Give Daddy The Knife Cindy, but struggled to do so. The album was released in the pre-internet days, so it wasn’t so easy to find information about albums and films from the past. Although many books had been written about films, including cult films, they were no help. Give Daddy The Knife Cindy was turning into a mystery. Record buyers who bought Give Daddy The Knife Cindy looked at the members of Naz Nomad and The Nightmares, but the problem was, none of of the names rung a bell. Many thought that looked like Naz Nomad and The Nightmares were a long forgotten garage band. One record buyer wasn’t so sure, and was determined to solve the mystery of Naz Nomad and The Nightmares. Having bought the album, they studied the album cover closely, looking at the credits on the front and then at the track listing. Many of the songs they realised had been recorded by sixties garage bands and psychedelic bands. So they began to check. Nobody But Me had been written by O’Kelly, Ronald and Rudolph Isley and recorded in 1962. Six years later, in 1968 it i was covered by The Human Beinz. That was strange, as the copyright on the album said 1967. The Human Beinz’s cover of Nobody But Me was released after the supposed release of Give Daddy The Knife Cindy in 1967? This seemed strange. There could be a simple explanation. Maybe Naz Nomad and The Nightmares remembered and enjoyed The Isley Brothers’ original version? This seemed unlikely, given nearly every other track was a cover of a song by a garage bands and psychedelic band. Surely, it would’ve been The Human Beinz version that Naz Nomad and The Nightmares preferred? It had raised his suspicions about the authenticity of Give Daddy The Knife Cindy. With that in mind, the other tracks on Give Daddy The Knife Cindy were checked? For the album to have been released in 1967, the latest the songs had to have been originally recorded was summer or autumn of 1967. Action Woman had been released by The Litter as their debut single in January 1967. Later in 1967, The Seeds released The Wind Blows Your Hair in September 1967. This meant Naz Nomad and The Nightmares had to cover the song after the release of The Wind Blows Your Hair. To release Give Daddy The Knife Cindy in 1967 was going to be a close run thing. Meanwhile, it transpired that many of the other tracks had been released either pre-1967. Paul Revere and The Raiders had released their cover of Barry Mann and Cynthia Weil’s Kicks in February 1966. The same year, 1966, Norwich born, but American based Big Pete released Cold Turkey. She Lied had been released by The Rockin’ Ramrods in 1964. Two years later, The Electric Prunes released I Had Too Much to Dream was released November 1966. In 1965, Kim Fowley had released The Trip in America, and London based The Others released I Can’t Stand This Love, Goodbye. Them released Can Only Give You Everything in 1966. With all these tracks checking out, only two remained. The first song was (Do You Know) I Know which was penned by The Nightmares. Who were Naz Nomad and The Nightmares? Maybe they were an obscure garage band from a small town in America? It was a mystery. So was the final track on Give Daddy The Knife Cindy, Just Call Me Sky. When he looked at the credit on the record label, suddenly he knew he had solved the mystery of Give Daddy The Knife Cindy. The song was credited to D. Vanian and R. Jugg. This was none other than David Vanian and Roman Jugg of The Damned. As he looked at the cover David Vanian was vocalist and tambourine played Naz Nomad. Roman Jugg was guitarist Sphinx Svenson. Meanwhile, drummer Rat Scabies was Nick Detroit and bassist Bryn Merrick was Buddy Lee Junior. He smiled as the last piece of the puzzle fell into place. Deep down, he had known all along that Give Daddy The Knife Cindy wasn’t a lost soundtrack from 1967. It was just a case of proving it. Now that he had solved the mystery, he decided to enjoy Naz Nomad and The Nightmares’ album Give Daddy The Knife Cindy. An enthusiastic reception awaits Naz Nomad and The Nightmares on Nobody But Me on Give Daddy The Knife Cindy. Suddenly, it sounds as if it’s Beatlemania again as squeals and shrieks accompany the band. Drums are panned left, while the vocal is panned right. It’s delivered with power while The Nightmares add harmonies. Meanwhile, drums pound, keyboards play and as the vocal drops out, a searing guitar is unleashed. Cue more shrieks as Naz Nomad delivers a vocal powerhouse and The Nightmares power the arrangement to its crescendo. As they do, it’s 1967 all over again. Naz counts The Nightmares in and drums pound, guitars shriek and as the vocal enters, it’s obvious that it’s The Damned’ David Vanian. His inimitable vocal gives the game away. The rest of The Damned could pass as a sixties garage band. Ratty sixties drums are part of the rhythm section, and combine with a blistering guitar. It sometimes, screams as a wash of feedback is emitted. Still, Dave grows in power as the action man roars on this cover of Action Woman. Keyboards opens The Wind Blows Your Hair, and are joined by rhythm section. They’re joined by a mid-Atlantic vocal. It seems Dave has adopted his Naz Nomad persona as he and The Nightmares pay homage to The Seeds. When the vocal drops out at the bridge, keyboards take centre-stage. This allows the listener to hear a very different side to The Damned. When the vocal returns, it completes this accomplished and melodic homage to The Seeds circa 1967. When Rolling Stone magazine compiled its list of the 500 Greatest Songs Of All Time, Paul Revere and The Raiders’ Kicks was at number 400. Naz Nomad and The Nightmares set about covering this classic. A guitar rings out as the organ and rhythm section combine. Naz takes charge of the vocal, while the drums pound and never miss a beat. Tight harmonies accompany the vocal and with the drums inject a degree of urgency. They play their part in the sound and success of this melodic and memorable cover of a classic song. A guitar slides across the arrangement to Cold Turkey, before the rhythm section, guitar and keyboards combine. Then Naz delivers a swaggering proto-punk vocal. When it briefly drops out, washes of organ and a searing guitar are unleashed. Soon, Naz is back and strutting his way through the lyrics. Machine gun guitar riffs and washes of organ accompany his vocal which later becomes a vamp. Meanwhile, The Nightmares have been transformed into a sixties garage band. She Lied literally explodes into life ,with lightning fast machine gun guitar licks accompanying the rhythm section. Dave’s vocal is a mixture of power and speed as garage rock and post punk combine. Later, there’s a nod to Chuck Berry before, before returning to the explosive and energetic sound. As the guitar and bass accompany Naz on I Had Too Much To Dream (Last Night) feedback can be heard. It has been sculpted so that it becomes part of the sound. Soon, drums power the arrangement along, while Naz delivers an emotive vocal. It’s a mixture of frustration, power and disappointment. Meanwhile Roman’s guitars play an important part in the sound and success of what’s one of the finest moments on Give Daddy The Knife Cindy. The Nightmares’ rhythm section combine with a probing, ringing guitar and create a mesmeric backdrop for Naz’s vocal on The Trip. It starts off more like a theatrical soliloquy, before growing in power and drama. Later, he vamps as guitars shimmer and add to the lysergic sound. There’s a lo-fi sound to I Can’t Stand This Love, Goodbye. That was the case with many sixties garage rock songs. However, there’s so shortage of energy and enthusiasm as the rhythm section and searing guitar and harmonies accompany Naz. His vocal is powerful and later, punchy. By then, The Nightmares are in full flight. A scorching guitar cuts through the arrangement to what sounds like authentic sixties garage rock. There’s a lo-fi sound to I Can’t Stand This Love, Goodbye. That was the case with many sixties garage rock songs. However, there’s so shortage of energy and enthusiasm as the rhythm section and searing guitar and harmonies accompany Naz. His vocal is powerful and later, punchy. By then, The Nightmares are in full flight. A scorching guitar cuts through the arrangement to what sounds like an authentic an garage rock single. There’s a dark, dramatic rocky sound to I Can Only Give You Everything. This comes courtesy of the guitars and rhythm section. Meanwhile, Naz forever the showman adopts a mid-Atlantic accent. Soon, his vocal becomes a vamp. Meanwhile, the dark, dramatic backdrop remains. Later, a blistering guitar and washes of organ are added during this homage to Them. It’s one of the highlights of Give Daddy The Knife Cindy. Stabs of organ open (Do You Know) I Know before it bursts into life. The rhythm section lock into a groove with the organ, while Dave unleashes a powerhouse of a vocal. He roars, yelps and scats while a searing guitar, keyboards accompany him. Meanwhile, harmonies and handclaps accompany him, during this fusion of garage rock, psychedelia and pop. Just Call Me Sky closes Give Daddy The Knife Cindy and Beatlemania returns. Applause is overdubbed as Naz Nomad and The Nightmares are introduced by the MC. As The Nightmares play, Naz introduces the band. Cue shrieks before Naz Nomad and The Nightmares take their final bow. Thirty-three years after Naz Nomad and The Nightmares originally released Give Daddy The Knife Cindy in 1984, Big Beat Records, an imprint of Ace Records, have reissued the album. It’s a welcome reissue of an album that caused confusion upon its release. Some people believed Give Daddy The Knife Cindy was indeed a lost sixties soundtrack. Soon, though. it became apparent that Naz Nomad and The Nightmares were actually The Damned. They might have kept the pretence up longer, if David Vanian and Roman Jugg had used aliases on Just Call Me Sky. That gave the game away. There were a number of clues that gave the game away. This included the inclusion of The Others’ I Can’t Stand This Love, Goodbye. They were a relatively unknown band from London. If Naz Nomad and The Nightmares were an American band, it’s unlikely they would’ve heard about The Others. Then there was the inclusion of The Seeds’ single The Wind Blows Your Hair, which was released in September 1967. This made it unlikely that Give Daddy The Knife Cindy was released in 1967. The evidence was stacking up against Give Daddy The Knife Cindy being a soundtrack from 1967. It seemed the album was a hoax. Ironically, The Damned were a convincing garage rock and psychedelic band. Much of the music sounded as if had been recorded in around 1967. The music on Give Daddy The Knife Cindy also showed another side to The Damned. There was more to their music than punk, post punk and gothic rock sound. Proof of this is Give Daddy The Knife Cindy, where they become Naz Nomad and The Nightmares and switch seamlessly between garage rock and psychedelia on this oft-overlooked hidden gem from The Damned’s discography .